Rector St John’s Church, Stoneyford. 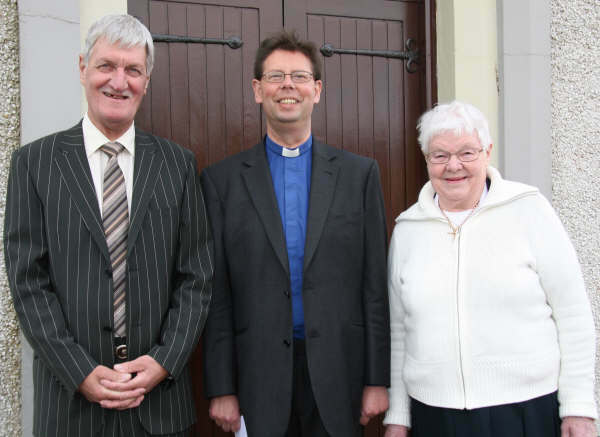 The Rev Allister Mallon pictured with churchwardens Wallace McMillan and Annie McDonald. Stoneyford was originally part of Derriaghy Parish, situated some four miles from the Parish Church. 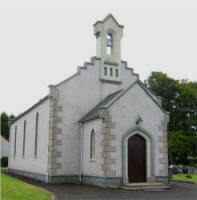 The Rector of Derriaghy held Sunday Services in the local schoolhouse. On 2nd June 1840, the Down and Connor Church Accommodation Society made a grant of £482 for the erection of a Chapel of Ease, with accommodation for 220. The Marquis of Hertford gave the ground for the new church and the cost of the new building was £554. St. John's, Stoneyford was licensed for public worship on 6th October 1841 and the church and churchyard were consecrated on 28th October 1874. It became a separate parish in 1887. On 7th December 1837 a licence was granted to the rector and curate of Derriaghy to publicly celebrate divine service in the school room in Stoneyford. On 2nd June 1840, the Down and Connor Church Accommodation Society made a grant of £482 for the erection of a Chapel of Ease, with accommodation for 220 people. The Marquis of Hertford gave the ground and St John’s Church, Stoneyford, was opened on 6th October 1841 by the Rev Savage Hall, vicar of Derriaghy and consecrated by Bishop Knox on 28th October 1874. It cost £554 to build and holds 300 people. The records of the parish for the years before it became a separate parish in 1887 are preserved at Derriaghy. The church was renovated in 1934 and when Mr Stranex became rector, it was re-roofed, a new heating system installed, an organ added and the graveyard greatly improved. The rectory, which was purchased in 1862, was demolished and replaced by a modern building on the same site in 1991. 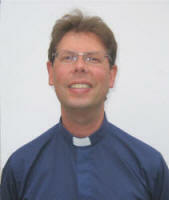 The present rector, the Rev Allister Mallon, was instituted in February 2000.